Ageing of skin occurs in all the layers of the skin. The texture roughens, the collagen thickness gets depleted, water content dries up, the fat layer shifts and muscle tone goes down. It is unscientific to expect a single treatment or a single cream to reverse all these changes. Ageing of the face causes a 3 dimensional change so treatment should address the changes in all layers. We at SkinCity advocate that the ideal anti ageing treatment should address all of the following - tightening & lifting, filling for hydrating & Skin brightening. Thus we advise the 3D facelift for optimum results. These can be taken in combination or separately as per facial assessment. An advanced facial ageing say after age of 35 years will require all of these components. For hyperpigmentation or dark spots the third aspect of ageing, the Helios laser technology is the unique solution for flawless skin it can remove most epidermal skin lesions like freckles and sun spots. This improves the texture and evens the skin tone, thus giving complete skin clarity which looks smooth and young. The ulthera laser works extremely well to tighten the SMAS layer which wraps muscles, it is known as HIFU and is actually ultrasound. It tightens the skin and stimulates the fibroblasts to make collagen, thus addressing wrinkles on the forehead, crow feet around the eyes, nasolabial folds and double chin. This takes 10 years off your face. At Skin City, our doctors are striving to provide solutions for antiageing. Looking good does wonders for our confidence & helps us be successful in every field. Wrinkles are formed on the face over time due to sun exposure & continuous muscle activity. These lines often make us look tired, angry or older than we are. Botulinum Toxin is one of the best & the most popular wrinkle reduction treatment available today. Botulinum Toxin is a US FDA approved natural, purified protein that relaxes wrinkle-causing muscles & creates a rejuvenated and more youthful appearance. 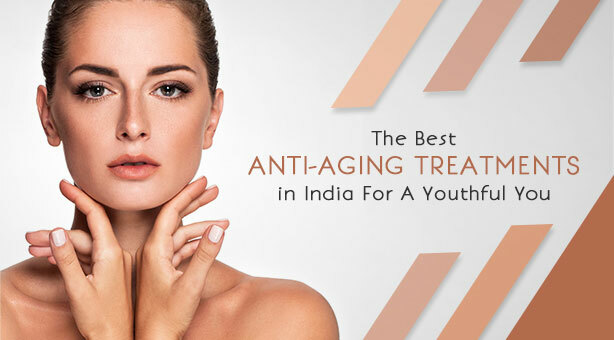 According to US FDA, anybody in the age group of 18-80 yrs (not in pregnant or breastfeeding women) of age who desires to get rid of their wrinkles & have a smoother appearance can get the treatment done. What are the indications for Botulinum Toxin? Few injections with a very fine, small sterile needles are given in the desired area. No anaesthesia is required. The pain is minimal, often described like an ant bite sting. For those who have a low pain threshold, ice packs can be used to alleviate pain. One can resume normal activities immediately. It takes effect after 4-5 days, with full effect 7-15 days post treatment. Effect may last for 4-6 months or longer, results vary from patient to patient. May last longer with repeated treatments. But result will wear off progressively (not suddenly). Will my lines worsen if I discontinue Botulinum Toxin? NO. Eventually, wrinkles will return as they were before the treatment. No long-term side effects reported in the 20 years of use. Most common side effect is tenderness and bruising at the site of injection. Some people may have a feeling of heaviness in the head for a few hours. Botulinum Toxin is a purified protein derivative of botulinum toxin A & has been used for the last 20 years safely. It is US FDA approved. It is also used for treatment of migraine. Botulinum Toxin is also approved for use in children over 2 years of age with cerebral palsy. CAUTION: IT SHOULD BE ADMINISTERED BY QUALIFIED TRAINED DOCTORS ONLY. Do you want to have high cheek bones/ sharp sculpted nose/ attractive pout like your favourite actresses? Nothing is impossible to achieve at Skin City, whether you wanted to have higher cheek bones, sculpted jawline or a narrow or straight nose, an oval face or full lips. 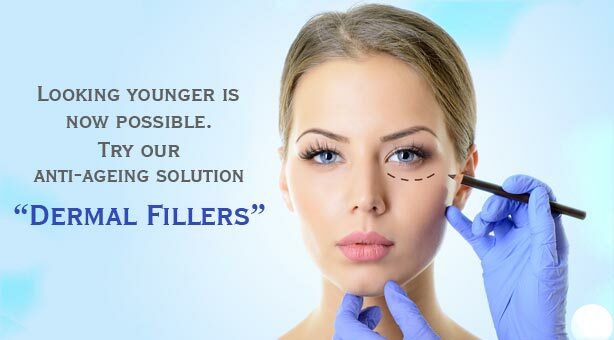 Hyaluronic acid fillers like Restylane, Perlane, Juvederm, Esthelis, Fortelis&Modelis are used for non surgical face lift which give you an instant result which could last upto 2 years. Fillers are injections given into the deeper layers of skin and subcutaneous tissue to make one look youthful. What is a HA filler? HA is a safe, US FDA approved dermal filler that is injected into deeper layers of skin and suncutaneous tissue for the correction of facial lines and wrinkles, such as nasolabial folds. HA provides long lasting correction of smile lines and wrinkles around the nose and mouth, and hands with a natural look. What are the indications for fillers? HA filler is gently injected into the skin in small amounts with a very fine needle. HA stimulates the body to produce new collagen. It absorbs water, increases in size and lifts up the surrounding area. This unique response provides immediate, visible improvement of folds and wrinkles and provides long-lasting and excellent results. It is done in a clinic setting by our trained dermatologists by injecting into the skin through a thin needle. It is simple, safe, quick. Most patients return to normal activities almost immediately after treatment. When the results are seen? The results are immediate and continue to improve as it stimulates your body to produce new collagen. Results may last a year or more in many patients. Many patients will achieve their desired result after just one treatment. In the follow-up visit, a touch up treatment might be recommended if required. Mild irritation, edema, swelling, itching, discoloration, or tenderness at the injection site may occur. They typically resolve within one to two days. Hyaluronic acid is a substance of natural origin, which is safe and completely biocompatible and wholly biodegradable with no risk of allergy. With wrinkles, fine lines, brown spots and a sallow blotchy skin creeping in, anybody can tell you are almost hitting the dreaded aging phase. Skin aging is a natural process that presents itself relatively early in life, sometimes as early as the late 20s. But, thanks to various anti-aging non-surgical treatments, women can now hop back in time. A few years ago, the most popular anti-aging remedies were plastic surgery procedures like brow lifts and facelifts. However, the trend has drastically changed over time with the development of non-invasive anti-aging treatments. Often referred to as minimally invasive methods, the skin treatments improve skin texture, rid of lines and maintain a youthful look. BOTOX is a toxin produced by a strain of bacteria, Clostridium botulinum. In case you're wondering, this is the same bacteria that can cause botulism, which is a type of food poisoning. Botox is used for the treatment of moderate to severe frown lines between the eyebrows. Today, it is used to treat other areas of the face, including the forehead and the crow's feet at the corners of the eye. Most commonly used to treat those with sun-damaged or unevenly pigmented skin, chemical peels have become one of the most popular non-invasive cosmetic plastic surgery procedures. Chemical peels are one form of anti-aging treatment. Although chemical peels are not able to prevent or slow down the aging process they are certainly able to improve facial blemishes, acne, wrinkles and uneven skin pigmentation. One non-surgical method that has become extremely popular is the use of dermal fillers. Dermal fillers such as hyaluronic acid should not be confused with Botox. Botox may be used for anti-aging skin care but works through a completely different process. Plastic surgeons refer to the use of dermal fillers as soft tissue augmentation. Soft tissue augmentation is a cosmetic plastic surgery procedure performed to correct eye wrinkles, other facial wrinkles, and depressions in the skin and/or scarring. As you get older, a number of factors contribute to the aging of your face. Stress, sun and wind exposure, and even gravity conspire to leave you older-looking. A facelift can help address some of the effects of aging. During a facelift, your plastic surgeon removes excess fatty deposits, tightens the muscles that support your face, removes excess skin and rewraps the skin of your face. Quite often, the facelift surgery is performed along with other facial surgeries such as blepharoplasty (eyelid surgery) or a browlift (forehead lift surgery). Laser skin resurfacing is one of the fastest growing and most effective skin rejuvenation procedures performed by plastic surgeons. Laser skin resurfacing can be used to treat a wide variety of skin conditions that result from or relate to the effects of aging. Acne Scars, Age Spots, Brown Spots, Fine Lines, Large Pore Size, Stretch Marks, Sun Spots, and Wrinkles can be treated with laser skin rejuvenation. Like dermabrasion, microdermabrasion involves removing some of the upper skin layers. Microdermabrasion, however, doesn't go as deep. Microdermabrasion is ideally suited for a person who has aged skin or skin that has been damaged by overexposure to the sun.Â Microdermabrasion treatments polish and soften the skin, reducing fine lines on the face. While the best non-surgical anti-aging face treatments are affordable and effective compared to plastic surgery treatments, patients ought to be cautious when picking their health providers. At Skin City, our doctors are striving to provide solutions for antiageing. Looking good does wonders for our confidence & helps us be successful in every field. Wrinkles are formed on the face over time due to sun exposure & continuous muscle activity. These lines often make us look tired, angry or older than we are. Botulinum Toxin (Botox)Â is one of the best & the most popular wrinkle reduction treatment available today. 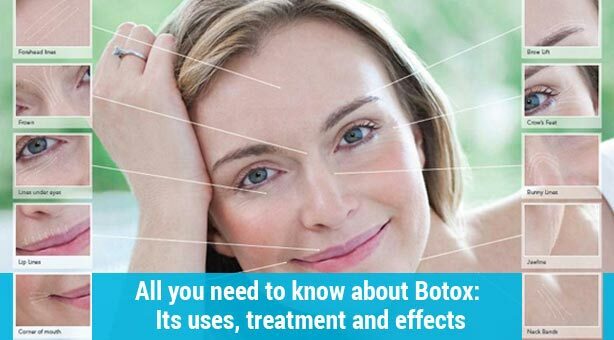 What is Botulinum Toxin? Botulinum Toxin is a US FDA approved natural, purified protein that relaxes wrinkle-causing muscles & creates a rejuvenated and more youthful appearance.According to US FDA, anybody in the age group of 18-80 yrs (not in pregnant or breastfeeding women) of age who desires to get rid of their wrinkles & have a smoother appearance can get the treatment done. What are the indications for Botulinum Toxin? - To remove frown lines: - Between the eyebrows - Crows feet around the eyes - Horizontal forehead wrinkles - Bunny Lines on the nose - Down turned corners of the lips - Neck bands (chicken legs) & horizontal lines - Chin creasing - To reduce broad jaws - To improve the facial contour - To lift sagging jowls - For improving gummy smile Hyperhidrosis : to reduce excessive sweating on palms & underarms How is the treatment done? Few injections with a very fine, small sterile needles are given in the desired area. No anesthesia is required. The pain is minimal, often described like an ant bite sting. For those who have a low pain threshold, ice packs can be used to alleviate pain. One can resume normal activities immediately. It takes effect after 4-5 days, with full effect 7-15 days post treatment. How long does the effect last? Effect may last for 4-6 months or longer, results vary from patient to patient. May last longer with repeated treatments. But result will wear off progressively (not suddenly). Will my lines worsen if I discontinue Botulinum Toxin? NO. Eventually, wrinkles will return as they were before the treatment. What are the side effects? No long-term side effects reported in the 20 years of use. Most common side effect is tenderness and bruising at the site of injection. Some people may have a feeling of heaviness in the head for a few hours. Is it safe? Botulinum Toxin is a purified protein derivative of botulinum toxin A & has been used for the last 20 years safely. It is US FDA approved. It is also used for treatment of migraine. Botulinum Toxin is also approved for use in children over 2 years of age with cerebral palsy. CAUTION: IT SHOULD BE ADMINISTERED BY QUALIFIED TRAINED DOCTORS ONLY . How does it work? HA filler is gently injected into the skin in small amounts with a very fine needle. HA stimulates the body to produce new collagen. It absorbs water, increases in size and lifts up the surrounding area. This unique response provides immediate, visible improvement of folds and wrinkles and provides long-lasting and excellent results. How is the procedure performed? It is done in a clinic setting by our trained dermatologists by injecting into the skin through a thin needle. It is simple, safe, quick. Most patients return to normal activities almost immediately after treatment. When the results are seen? The results are immediate and continue to improve as it stimulates your body to produce new collagen. Results may last a year or more in many patients. How many treatments are needed? Many patients will achieve their desired result after just one treatment. In the follow-up visit, a touch up treatment might be recommended if required. Side effects? Mild irritation, edema, swelling, itching, discoloration, or tenderness at the injection site may occur. They typically resolve within one to two days.. How safe are they? Hyaluronic acid is a substance of natural origin, which is safe and completely biocompatible and wholly biodegradable with no risk of allergy. © 2017 Skin City. All rights reserved.